If you want to study Political Science, you should enrol in a course at University. Or, for a simple practical introduction, you could look at the March 15 announcement from the CSIRO and Bureau of Meteorology. Now this is technically correct, but it is also less than honest. 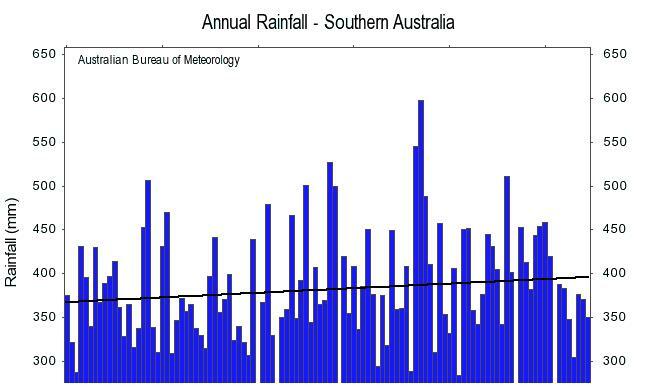 Australia has rainfall records going back in some places to the 1870s. BOM’s charts and graphs are reliable apparently from 1900. Why not show these? Because they do NOT support the implication that Global Warming is causing much of Australia to become drier. But compare with the trend map from 1900-2009! Note the much debated Murray-Darling Basin, the food bowl of Australia, is wetter, in some parts much wetter, than 110 years ago. Yes, South West of WA is getting drier. Not the first time that BOM got it wrong: the Seasonal Outlooks from November, December, and January were spectacularly so. But the document is less science than political advocay. This last week there have been a series of daily alarming reports on global warming in Australia. The ordinary Australian citizen has a robust attitude to politicians: distrust. When scientists are linked with a political position, or become advocates; or when politicians such as Mr Rudd, Senator Wong, Barack Obama, or Al Gore, make scientific pronouncements, the distinction between the science and the politics becomes blurred. The danger for scientists is that they will become tarred with the same brush. Science in general will be the loser. This entry was posted on March 20, 2010 at 5:02 pm and is filed under Uncategorized. You can follow any responses to this entry through the RSS 2.0 feed. You can leave a response, or trackback from your own site. Ken, if you dont’ mind I’m going to query the conclusions you arrive at. The 1900-2010 map is the *statistical average* of rainfall patterns for that 110 year period. It does not show trends. All that single map does is indicate general rainfall patterns across the continent as averaged out over 100+ years. The way to determine a trend is by comparing the annual averages for these distinct data sets. A single trend map cannot be looked at in isolation, as this does not tell you very much. It needs to be looked at as part of the above sequence. What you will see – if you run the maps from the links you have provided – is changing rainfall patterns across the continent. They do not indicate an overall decline in the quantum of rainfall, but a very clear shift in their distribution: the very thing predicted by climate modelling. Given this is historical data, it is a very convincing and powerful argument supporting the CSIRO’s and BoM’s assertion that changes in climate are linked to increased CO2 levels. Yes I have looked at all the trend maps. Yes they do show changing rainfall patterns over time. 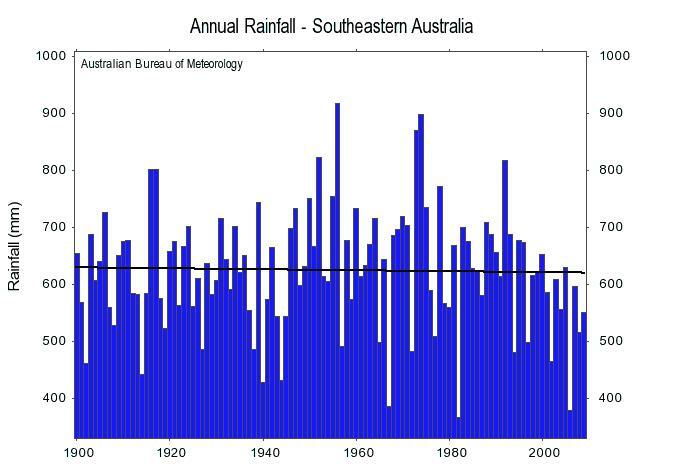 But they also clearly show that apart from the SW of Western Australia, and a few other areas including where I live, rainfall for most of Australia is NOT less than it was a century ago. The time series graphs for the different regions show this even more clearly. I much prefer the time series graphs and only used the maps to illustrate that the report did not show all the information. So no, I disagree: it is a very convincing and powerful argument AGAINST the assertion that changes in climate are linked to increased CO2 levels. And another thing, I would look at the maps in the reverse order: start with 1970-2010 and go back a decade at a time. That clearly shows that the short term view of the data shows serious drying, but looking at the longer term this short term trend is seen in perspective. Variable Climate Deniers such as yourself always prefer short term trends. I don’t agree with those who claim that “the world hasn’t warmed for 10/12/15 years” as that is far too short. I also don’t think 50 years is long enough. Check the graphs from 1900. This is exactly what climate science has stated would happen. 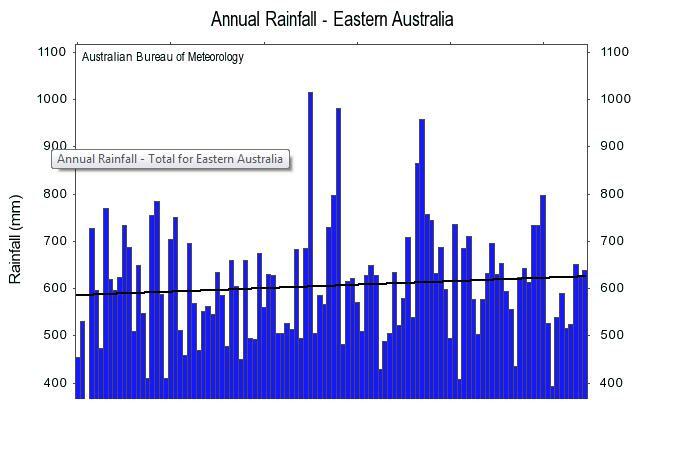 So we agree there is a changing rainfall patterns based on the BoM data. The maps form 1900 are the ***baseline**** to measure further trends against. Does that make sense? This is how you determine long term trends. In of itself it is a statistical average over 110 years that shows us general distribution patterns. Don’t be mislead by the term “trend” – it means refer to the other maps, not in isolation. You refer to the data as authoritative, and yet arrive at completely different conclusions than the BoM and CSIRO? This is public domain data of the highest quality – have you considered that they have got it right, and that your analysis needs to be revisited? With all due respect – can everyone else in science be wrong, and you the only one right? Now look at your graphs for SW Australia – a decline? Then look at the trend maps. That’s the food bowl areas of Vic and NSW. That implications for agriculture are significant. 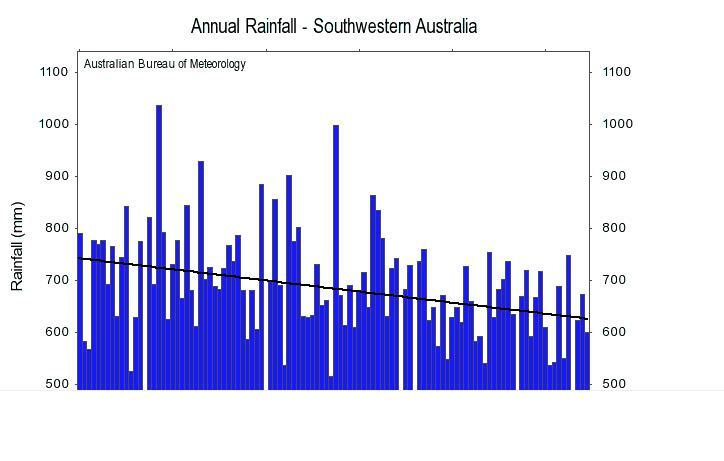 Rainfall in N Australia has gone up – but only in the west of Queensland. Rainfall is declining along the coast. It is more concentrated in areas, which skews the average for that part of the continent. This is why – as the BoM clearly states you need to look at the maps and trend lines. Look at the maps again. From a statistical point of view, these are sufficient data sets to demonstrate trends. Mike, the food bowl area of the Murray Darling basin – not SW of WA- clearly shows they have returned to the conditions of 65 to 95 years ago. Put an 11 year trend line on the MDB time series graph and you’ll see what I mean. The problems with the MDB arise from over allocations of water based on unrealistic expectations of continuing good seasons from the 1950s. 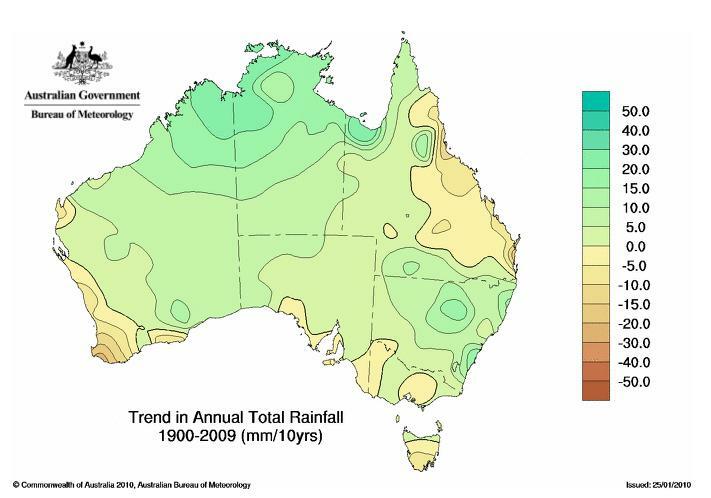 The trend map for 1960-2009 shows the trend from the *baseline* of 1960 and BOM rightly says this shows drying since then. So one could be excused for thinking that a trend map from a baseline of 1900 shows the widespread lack of drying since 1900. You can’t have it both ways. 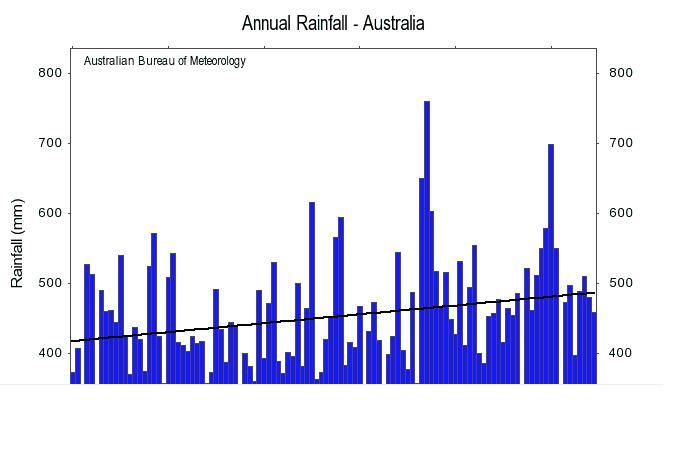 I am clearly saying that the BOM/CSIRO report, as far as it goes, is technically right on rainfall since 1960, but that this is only half the story. I am not looking at temperatures in this study, only rainfall. Ken it is “half the story” because the the temperature rises due to climate warming start to spike during the post-war period. – leads to changes in rainfall patterns. 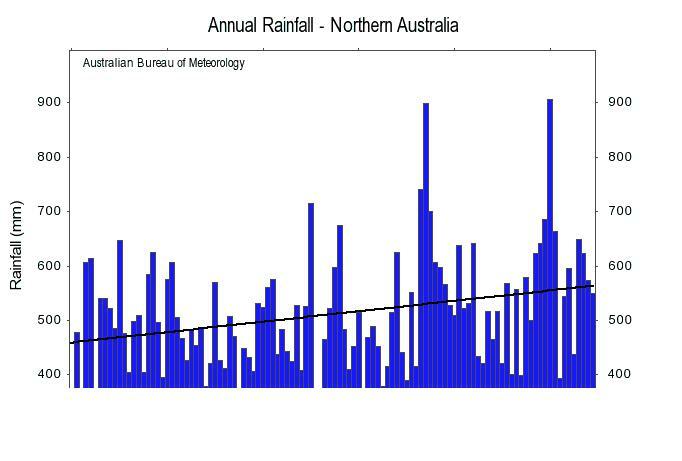 “the areas with decreases are those areas subject to increased rainfall (NW Australia)” . So how come temperature here didn’t go up as well?And which came first, the chicken or the egg? Temperature/ rainfall correlation: could be temperature leads to drought in some areas due to changing wind patterns etc; also could be that drought conditions ( clear skies, low albredo, low humidity, little ground cover, not much to evaporate) leads to higher temperatures. Haven’t even started on UHI, siting issues, incomplete data records. Besides, my point is that any droughts/ dry periods, even the recent “worst ever drought”, are not exceptional in Australia. The records show we have seen it all before. 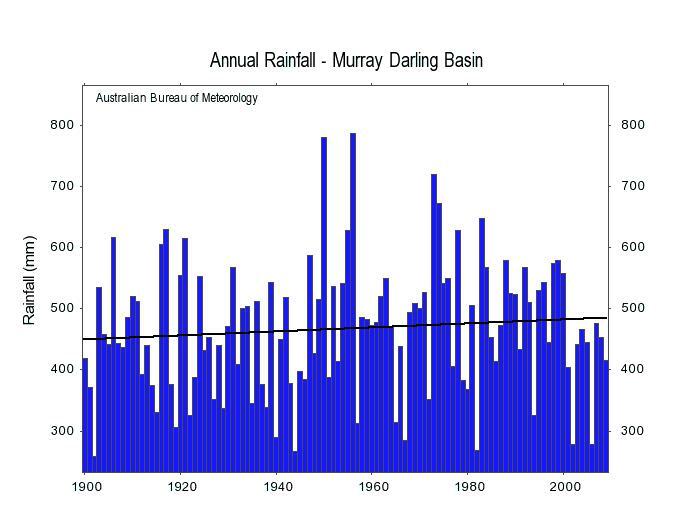 Australia has always had droughts, floods, drying trends, wetting trends, long before anyone heard of CO2. The BOM data in its entirety says basically little change, despite any apparent temperature changes. “International research” really ?? you mean the Climate Research Unit, at the University of East Anglia and the totally discredited “Hockey Stick” graph. Pull the other one. And of course the 90% certainty is not what the BOM or CSIRO have determined, it is simply echoing the conclusion in the IPCC 2007 report. The 90% certainty is actually based on scenarios using climate models that have so far shown to be wrong in predicting temperature variations. They are only crudely representing the world’s climate variations with a pre-assumed CO2 as the driver of the climate. Clouds, water vapour (the largest ‘green house gas’), solar variations etc are not part of the modeling code. Sorry chaps this is not proof or certainty – you’ll have to come up with something more concrete than that. How an organisation like BOM or the CSIRO could have allowed this false and misleading statement to be published in my opinion is beyond believe. It indicates to me they have, or the person(s) who wrote and allowed it little knowledge about hydro-geochemistry. Seawater has a pH in the range 7.9 to 8.2 , that is its alkaline not acidic (pH less than 7). The oceans are a vast reservoir of natural occurring CO2 and when seawater temperatures rises CO2 is expelled to the atmosphere whilst in colder water CO2 is absorbed. CO2 in ocean water is in turn chemically buffered (by rocks) and converted into bicarbonate and then calcium carbonate (CaCO3), which is the inner material marine shells are made of, and also which forms limestone. In past geological history concentrations of CO2 have been more than a magnitude greater than 360 ppm they are now (due to volcanic activity and deep-sea vents. These vents to a lesser extent are active to the present day) and the seas were not acidic otherwise life as we know it would not have developed from our oceans. What we find in the geological record of course are huge thicknesses of limestone strata in areas previously occupied by the sea. The alarmist’s conceptual model that human CO2 raises temperatures amuses me when it’s actually the reverse – rising temperature raises atmospheric CO2 expelled from the oceans to a much, much greater extent than humans contribute and would ever contribute. The circulation of CO2 in the atmosphere is only in the range 5 to 10 years with oceans, soil and vegetation removing it from the atmosphere over this period of time. CO2 is not a pollutant but plant food/fertilizer and necessary for the biosphere. I’ve been away for Easter. Luckily most people in Australia (I hope) have learnt to take BOM/CSIRO pronouncements with a grain of salt. Not sure whether you have seen the graph at Watts-Up-With-That by Willis E. plotting the US 10 year monthly temperature averages for more than 100 years that puts “global warming” in perspective. I reckon its worth doing for the ozzy data as well. Send a copy to Andrew Bolt and the newspapers to keep those journos up to date with the billions we are about to spend and what we are spending at present on a storm in a tea cup. Yes I did read it- puts it nicely in perspective! I’m working on another (big) job at the moment but I might give it a crack. I read the State of the Climate report and did a “protasis” count on it. This is a count of equivocal terms, such as “could”, “might”, “if” (condition is true), et cetera. This document gets a score of 10. A scientific paper, by definition, should get a score of 0. I then looked for statements with unsubstantiated declarations: declared “facts” with no references. This document gets a score of 7. Again a scientific paper should get a score of 0. Our old friend, the hockey stick appears in section 4, but now applied to gas concentrations, which may well be valid, EXCEPT that the line for methane does not extend as far as the line for carbon dioxide, but dips slightly and then disappears. Could this be a “trick” to hide a decline in the level of methane? In section 3, under Ocean Acidification, is the statement, “The world’s oceans currently absorb about 25 per cent of the carbon dioxide generated by humans – about 40 per cent of this is absorbed in the Southern Ocean”. This is a curious statement because, as far as I am aware, the proportion of anthropogenic carbon dioxide increase has not been demonstrated. Thus we are asked to accept responsibility for 25% of an unknown quantity. Furthermore, 40% of this unknown quantity is absorbed in the Southern Ocean – another remarkable situation since there is no explanation on how this was measured or derived. My conclusion is that the data and graphics may well have been from scientific sources, but the text of this document was provided by a PR department somewhere (and by a junior, at that). And the rest of us poor suckers. In no way can the report be described as scientific. We have challenged the NIWA temp record in New Zealand on very similar grounds. This has led to a “review” of the official record, which has involved the full-time work of 5-6 scientists during the past 6 months. This project is due to report next month, and it will be ‘independently peer-reviewed’ by BOM. If you would like to email me directly, I’ll send you some materials you might find of interest.